I’m not one for recipes and measurements because I often find that I’m missing an ingredient or unable to use an ingredient. For five years, I cooked 100% dairy free. I used to substitute but I quickly ran out of items to substitute, Since then, I’ve decided to go it on my own, no recipes, no rules; at least most of the time. 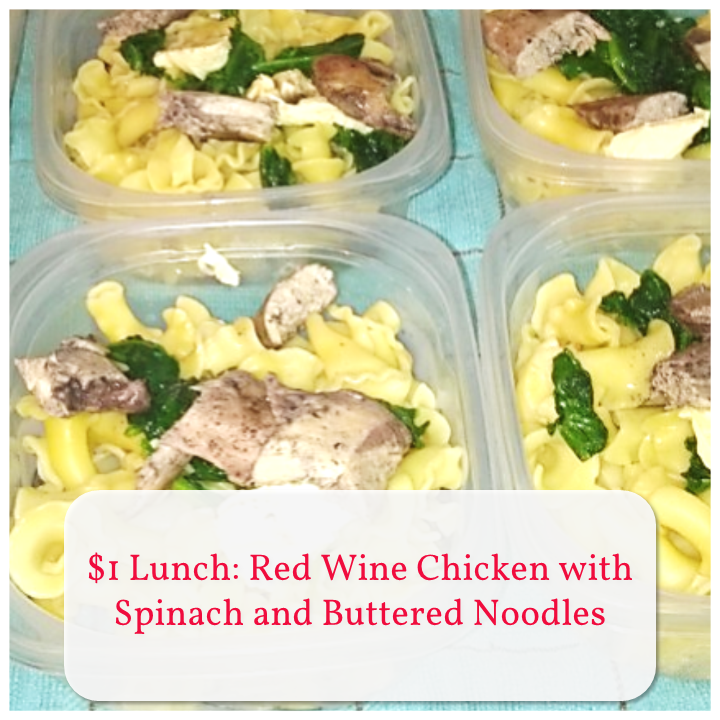 This is one of my favorite quick, easy, and cheap meals to make to bring to work for lunch. It’s just enough to keep me going though the work day and satisfy my need for delicious food. 1. I’m confident that you know how to cook noodles. I added a bit of oil and salt to my water for flavor and to help the noodles from sticking. 3. Cover chicken half way with red cooking wine. 6. Put a small amount of oil in a round pan that has a lid. Add spinach and any spices (I used the same from the chicken) to the pan. Toss the spinach then cover until wilted. Add more spinach if necessary. I am still so excited about how easy and delicious these lunches were! 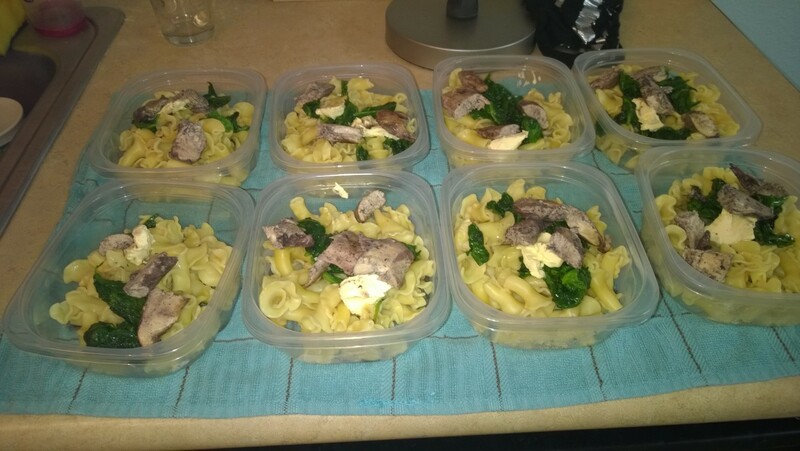 All of my ingredients were purchased as they went on sale and with the use of coupons so they entire set of lunches was made for $8 which is only $1 per lunch! What a win! **Wondering where to get tupperware for free? Go to the packaged lunch meat section of your store. Many kinds of lunch meat come in tupperware that you can wash and reuse and if you’re lucky you’ll hit a sale with a coupon! A woman after my own heart. I love to cook but never use recipes or measure either. And saving a buck on tuperware, so my kind of gal! Great post.